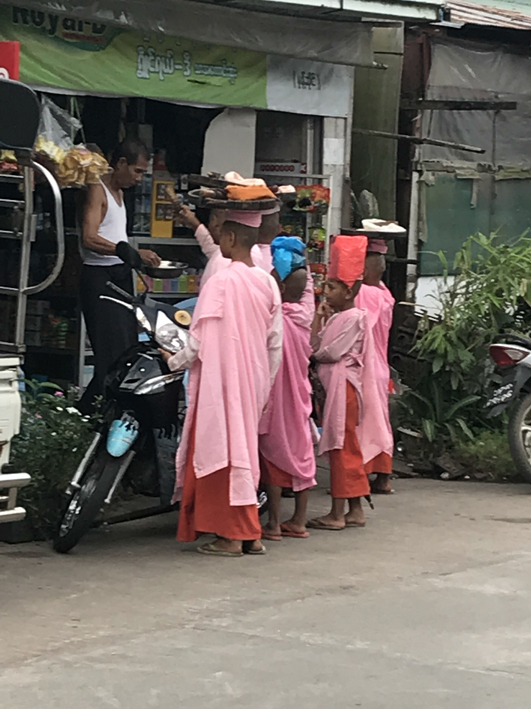 One of the first things you notice in Myanmar is there are an awful lot of monks. Not the odd orange-robed monk that I remember from Thailand. But monks everywhere (up to half a million apparently), from very young to very old. They wear dark red robes, and they are particularly noticeable walking around barefoot in the early morning, seeking out donations of food for their morning meal. Some go singly or in small groups; others are in long lines - maybe 20-30 monks of all ages, walking in single file according to seniority, sometimes with a monk at the back ringing a bell. Each monk has his round wooden alms bowl and they go around to houses, shops or market stalls where people wait to put something in their bowl - often a spoonful of rice, some curry, a packet of flavourings, vegetables or fruit, sometimes money, occasionally something like washing powder or razor blades. It's not too hard getting lay people to donate. 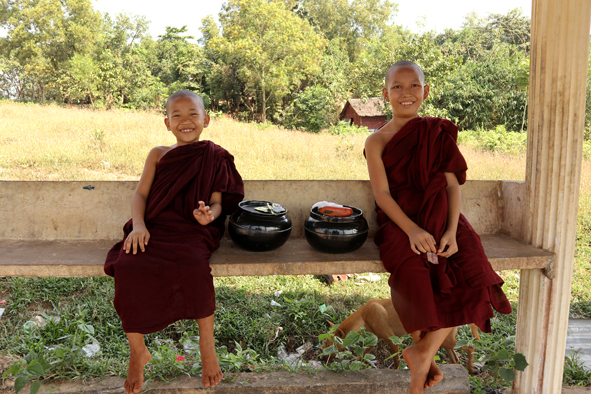 Almost 90% of Myanmar's population is Buddhist, and monks hold the highest status in society. Women get up super-early in Myanmar, partly to get rice/food ready before the monks come round. 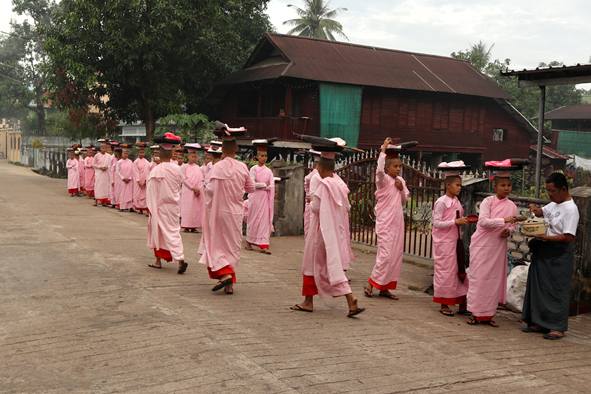 Nuns go round too, in pink robes, with (depending on the region) a tray for the alms on their heads, or a bag for the alms and a conical hat, or a folded cloth on their head. They have lower status than monks. Pah. The idea of being a monk/nun and the rules around collecting alms were utterly mysterious when we first arrived. My ignorance about this, as about so many other things, was infinite. So I've tried to learn a bit - mostly from the internet, but also from talking to people. Apologies if you know lots about monks and their habits (sorry! ), but I've found it fascinating. I'll give you a bit of an idea of what I've discovered. Most of the information around is about monks, not nuns, but I'm assuming similar rules apply. 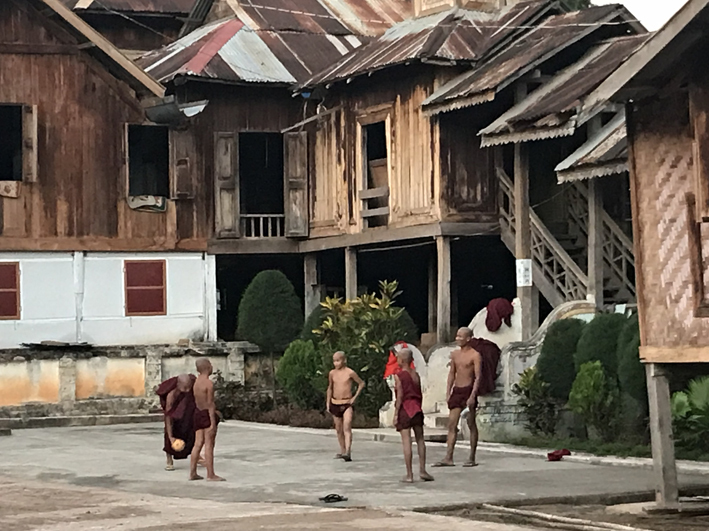 The morning alms round is fundamental to Burmese Buddhism (and maybe in other parts of the world) and is incredibly important for both receiver and giver. And there are strict rules. For example, monks can't favour rich or poor neighbourhoods in the hope of getting a better quality meal, and must accept anything they are given (though they can swap it later with another monk). Traditionally, the wooden bowls don't have compartments, so everything goes in together - curry and cake, oranges and a packet of seasoning in one glorious (but stomach-curdling) mess. However non-purists are allowed to use the upturned lid of the bowl for a degree of separation (cookies from sauces, for example) and some wimps have bowls with compartments. Monks are not allowed to ask for anything directly (except in an emergency), are not allowed to express thanks for what they receive, and cannot make eye contact with the donor. Most foods (there are a few exceptions like fruit juice, butter and sugar) have to be eaten the day they are given - no hoarding for a rainy day or saving something for a snack later. Collecting alms isn't seen as begging, but a way for the locals (even very poor people) to do the deed of dhana and acquire merit. In fact, the Buddha got very cross with one of his followers who didn't go out very often because he fasted for a week at a time, and didn't need the food. Thar was unfair on people who were denied the chance to give alms, apparently. The benefits for the giver are greater, I understand if they give the food to the monk with their own hands. We were told that people in richer areas without a monastery nearby often drive to a monk route in the morning to give out food. As a monk or nun, you get two meals a day - a very early breakfast (5am-ish, I think) and then lunch. After 12pm, can't eat again until breakfast the next day. 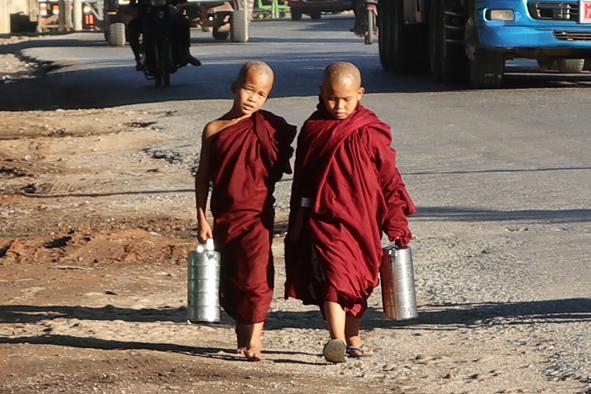 You have to walk around barefoot when you are collecting your alms in the early morning, though I've noticed monks mostly wear jandals/flip-flops the rest of the day. Monks only get to eat what they collect (and unlike European monks, they aren't allowed to grow their own food). Certainly you don't see many fat monks in Myanmar, and some of the older ones (who presumably are life-long followers) are positively skeletal. 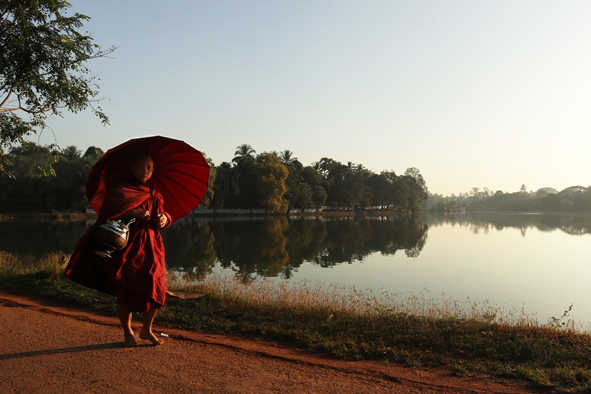 Hopefully life will get less tough for monks as the Myanmar economy improves. Monks have eight compulsory possessions (robe, alms bowl, water filter (so bugs don't get into the water and die, because the number one precept is around not killing living things), needle and thread (to mend their robes), belt and some others I have forgotten. They can also have things that assist them in the pursuit of Buddhist life and learning - an umbrella to keep off rain and sun, paper, religious books, medicine, basic furniture - but NOT a high or large bed, perish the thought. Entertainment is frowned upon - so no YouTube, TV or video games, sorry guys. TIckling another monk is frowned upon, as is hiding another monk's needle case/belt/alms bowl etc, even as a joke. You can't go for a pleasurable swim, light a fire to keep warm, or swing your arms about in a public place. You absolutely mustn't discuss Buddhist teachings with a layperson carrying an umbrella. It all sounds a bit serious to me. Still, novice (kid) monks get lighter treatment - being allowed to play football and the impressive kicking volleyball game. You even see novices with cellphones, though I suspect the abbot doesn't know about that. Like i said, there are anything up to half a million monks from a population of around 53 million. They aren't all "professional" monks, however; all males are expected to enter the monastery at least twice in their lives - once between 10 and 20 years old (or sometimes younger), as a novice, and once after 20, as a monk proper. You might spend 1-3 weeks as a monk, or you might stay for life. You might do your two stints, or go back for more. A few of the Burmese refugee guys working with Geoff in New Zealand have returned to Myanmar recently to do their stint as a monk. Quite a lot of girls/women also do short periods being a nun, but it isn't expected in the same way as for men. Life as a monk involves lots of praying and study, very strict discipline, sleeping in a dormitory, and washing with cold water. But for many people, especially in rural areas, it's one of the best ways for a kid from a poor family to get an education. Moe, a young guy I met in Hsipaw, had been a monk for seven years, in both Mandalay and Yangon, before leaving to earn money for his family - first in the construction industry in China and then as a guide in Hsipaw. He said he had learnt a lot as a monk - first Pali, the language of the Buddhist scriptures, and what monks are chanting on TV in the morning. Later, Moe had learnt English and Chinese - both of which had been useful later on. But the monastic life is not for everyone. Sai, our fabulous trekking guide in Hsipaw, described his three weeks as a novice monk (he was about 13) as some of the worst days of his life. For him, getting up super-early and not eating after midday were the main hardships. Seems teenagers are the same all over the world. Sai said his parents had given him a bit of money when he left for his three-week stint and for the first couple of days he used it to buy noodles. He hid them in his dormitory and snuck out and ate when everyone else was praying. But his ruse didn't last long - on the third evening a monk found him eating and he got the "bamboo massage" treatment (a beating). At the end of the third week, all the novices were asked if they wanted to stay longer. Sai politely declined and returned joyfully to his village.